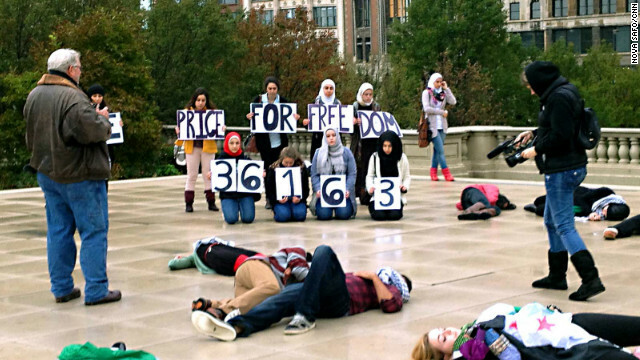 Syrian-Americans and supporters stage a "die-in" demonstration at Millenium Park in downtown Chicago. (CNN) – Noura Almasri, 34, had not expected to be working to aid Syrian refugees. A little more than year ago, she had a job in corporate finance and rarely paid attention to the news. But in March, 2011, Syrians began to protest against their dictator Bashar Al-Assad, and he responded with brutal force. Almasri, along with others in her Syrian-American community in Chicago, watched with alarm. Over the last year and a half, they have begun to act. Almasri quit her job, and now works to aid Syrians and to offer a public voice of support for Syrian rebels. That’s a sentiment shared by many other Syrians, including Ahmad Faour, 22, who said he was a medical student in Syria just four months ago. Now, far away from the violence, he wants to raise awareness about the horrors he left behind. Syrian-Americans supporting the rebels say it is only a matter of time before Assad’s regime is toppled. But they want to world community to help quicken his downfall. The conflict has left 29,000 Syrians dead, according to opposition groups. Syria, the home of Hezbollah, and many other terrorist groups, why should we really care if they destroy themselves, that keeps them from trying to destroy us. We should see the thanks we are getting from Iraq and Afghanistan and Egypt as reason enough to leave them to themselves. After they have a chance at democracy the new leaders will decide they like the input of others just like the last one didn't and they will be back where they started with just different leaders doing the brutalizing. Not everyone around the world and even the US likes everyone to have freedom of speech just the people they like. What happens in Syria should stay in Syria,we dont want it!!! I'll confront Syria from Las Vegas too, I'll go out into the desert and throw rocks east. Your style is unique compared to other people I've read stuff from. Thank you for posting when you have the opportunity, Guess I'll just book mark this web site. How are they freeloaders or backwards? Seems like when people reach for the guns, they only fuel the revenge that explodes after the killings on both sides. It goes on and on until they either run out of ammunitions or die. At what point do they get confused about which sides they are on and if, in fact, there is a side ? I always wonder how they can tell what people they kill since they are all similar. Very confusing and very sad. They are simply killing each other for no reason at all. That is how I see it. what is that rant about ? forget your meds today ? Wow, this is awful. What a dickish thing to post under an article about Syrian refugees. I don't see how this is relevant in any way. Either way, ebonics is a different way of talking, yes, but its by no means linguistically inferior. It has strict rules, and just because there is a stigma attached to it doesn't mean they are any less of a person than you are. From reading this board, I can say there is a lot of aggressive behavior which likes to blame everyone from the history of our country to the present. All I can say is: we are doing great in the US. We are not getting murdered every day by men with automatic guns , grenades or cluster bombs. We will vote for our president mostly for his second term but some will choose to vote for the other guy. We have choices, you see. So far, we have been able to practice a multitude of religions, or not to have any at all. We eat well and sleep in comfortable beds...and we talk, openly about our views, political and otherwise. See, we do not have a lot to complain about so we can be open minded about your problems and try to give you some suggestions, which you do not take very well. Your loss. Stop trolling and talking bad about America, you piece of crap. America is the country of murderers? Just exactly what is the entire Middle East Islamic nations like? murderers without mercy and forgivness, only seeking wrath and taking God's law and chucking it down the drain while murdering for the sake of satan...oops sorry...Allah. America is the hipocrate country? What the hell ar eyou doing here then? What are you all Islamic radicals doing in a country that loves Christ and does rather well because we still worship the one true God : CHRIST. Don't come to this nation to insult the one true God an dthen turn around and call us murderers, first look at your religion, your ways, your lack of all, your no freedoms, and your love for hatred and then see if you are getting something out of it from the real God...coz by the looks of it....none ofyou islamic nations are doing that great because you are sided not with God but with his enemy. Satan never gives abundance or freedom, he destroys! So any nation that goes against anybody who worships the true God ...they will also not get so favored by the real God...thus no progress in how many nations of the M.E????? YES...ABUNDANCE...PROGRESS AND FREEDOM AND LOOOOOOOVE COMES FROM THE REAL GOD. DO YOU SEE ANY OF THIS IN THE MIDDLE EASTERN NATIONS? count the nations in turmoil and see where is the god in them? Nowhere coz he is not there. Do you know when was the last time that your Islamic god gave you abundance and peace? The way to verify if it is really God it is by counting the miracles He has done for a nation or a person. Yes God, the real God YWVW grants miracles and has all prophetically time lined since ancient times. Isaiah lived 2700 yrs before Christ came to earth. Isaiah spoke up to the world to verify who is the true God. How many miracles and healings and super abundance has most of the M.E. nations had? I can say this, I have seen so many miracls in my lifetime, and miracles that cannot be replicated by any human. But you cannot say this about any of the Islamic countries which are in dire straits, some wanting America's help, others ready to plunder it. don't give more help to the mIddle easter islamic nations, you people don't understand, that when their time comes they will turn around and kill you and take over a free nation. The Truth.... is a 3 edged sword. whoa , dude....chill.....you are out of your mind.....it's people like you that kill all possibilities of peaceful TALKS ! the only way your country will survive is to TALK.....with your opponents and everyone. TALK......and put down the guns. – many of the same people who want to call for peace were the same ones who were sending arms across the Iraq border that killed our men and women, but now that it's your people dying you now want help? – you make a deal with islamic militants to help overthrow assad and you think once that's done these militants will just leave Syria to it's own end? I really wish you people well but you've put yourselves in a bad position. "the truth that sets you free" is in the Bible and it is about "the truth THAT CHRIST IS THE SON OF GOD AND THE ONLY WAY TO ETERNA LIFE". Refuse the truth and you will never have or see freedom in the next life. You can sure kill in this world, and you do it well with all that hatred for love and love for destruction. But when your turn is over and you show God Almighty that you rejected Him and prefered satan, and his ways, then you will lose total freedom (pay attention people because if you want freedom , FREEDOM DOE SNOT COME FROM SATAN and religions are from satan. God is not a religion nor is God mocked nor is God reached by killing anybody. You want freedom? drop your weapons and love your neighbor! The only one who promotes hatred and kililing and taking up arms in rebelry as we see the Middle East in turmoil everywhere, it is satan. And all his followrs. There is a reason for satan to be here, he wants to finish you! And so you are all decieved in fury and hatred the very thing that will destroy your eternal freedom. Enjoy then your killings! Just don't point fingers at Christ when you find yourself in hell and no way out. Onc eyou leave this world, once you die here, you will not have anothr chance at reaching God if you rejected Christ His Son, Christ who is GOD!